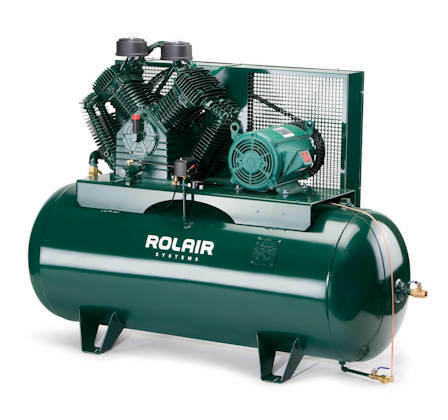 10 HP, two-stage electric stationary air compressors on a variety of tank configurations. Model H10312K60 shown. Click to view all models in this category. Optional Equipment: Magnetic Starter, Automatic Tank Drain, Low Oil Shut Down, Level-Rite Mounts, Vibration Pads, Dual Controls, Head Unloader, Refrigerant Air Dryer, Air-Cooled Aftercooler. H10160K50 10 Single 60 Gallons, Horizontal 1740 40.2 @ 175 PSI 32.4 @ 175 PSI 52" 23" 52" 650 lb. H10112K50 10 Single 120 Gallons, Horizontal 1740 40.2 @ 175 PSI 32.4 @ 175 PSI 72" 30" 56" 830 lb. V10112K50 10 Single 120 Gallons, Vertical 1740 40.2 @ 175 PSI 32.4 @ 175 PSI 40" 28" 77" 820 lb. H10360K50 10 Three 60 Gallons, Horizontal 1740 40.2 @ 175 PSI 32.4 @ 175 PSI 52" 23" 52" 635 lb. H10312K50 10 Three 120 Gallons, Horizontal 1740 40.2 @ 175 PSI 32.4 @ 175 PSI 72" 30" 56" 815 lb. V10312K50 10 Three 120 Gallons, Vertical 1740 40.2 @ 175 PSI 32.4 @ 175 PSI 40" 28" 77" 805 lb. H10160K60 10 Single 60 Gallons, Horizontal 1740 41.1 @ 175 PSI 33.7 @ 175 PSI 52" 25" 50" 680 lb. H10112K60 10 Single 120 Gallons, Horizontal 1740 41.1 @ 175 PSI 33.7 @ 175 PSI 72" 30" 54" 860 lb. V10112K60 10 Single 120 Gallons, Vertical 1740 41.1 @ 175 PSI 33.7 @ 175 PSI 40" 30" 75" 850 lb. H10360K60 10 Three 60 Gallons, Horizontal 1740 41.1 @ 175 PSI 33.7 @ 175 PSI 52" 25" 50" 665 lb. H10312K60 10 Three 120 Gallons, Horizontal 1740 41.1 @ 175 PSI 33.7 @ 175 PSI 72" 30" 54" 895 lb. V10312K60 10 Three 120 Gallons, Vertical 1740 41.1 @ 175 PSI 33.7 @ 175 PSI 40" 30" 75" 830 lb.